TU HOSTIN Review 2019: Is TU HOSTIN a Good Hosting? Peru’s Tu Hostin has provided web hosting services to over 2,200 clients in Peru since 2011. It offers shared hosting as well as complete web design packages. Its website is in Spanish. Founded in 2011, Peru’s Tu Hostin is a web hosting provider that uses redundant, multi-server systems to maintain a 100% uptime rating. It offers shared hosting plans that include a free domain and 24/7 customer support. It also provides web design and e-commerce store creation packages. It has served over 2200 clients in Peru since inception and the website is in Spanish. The basic Economic package includes: 1GB of storage space, 10GB of data transfer per month, 200 email accounts, and eight MySQL databases. Stepping up to the Premium plan, data increases to 4GB of storage, 40GB of data transfer per month, and unlimited email accounts and MySQL databases. Tu Hostin hosting plans come with the SimpleScripts one-click software installer. This allows customers to install over 70 different software scripts onto their website. Some of the things you can add include a WordPress blog, an e-commerce shopping cart, a forum, and much more. SimpleScripts also includes a website builder to make constructing your website fast and easy. For customers who are interested in having a custom website or online shop created for them, Tu Hostin offers complete web design packages. Available features include an animated banner, multimedia image and video galleries, social network links, map location, and contact form, as well as full e-commerce support with product pages and a shopping cart. Pricing for Tu Hostin shared hosting plans is very affordable. The basic entry-level plan costs around 50% less than many international hosting providers, while the higher-tier plans come in closer to average for the data allowances. Compared to other Peruvian hosts, Tu Hostin’s prices fall in the middle of the range as prices in Peru vary from very cheap to significantly more expensive. Customers opting for a web design and creation package will see prices for this service starting at a basic level that is very affordable and includes hosting and domain in the price. Compared to many website design packages found in the U.S., this package is around 33% of the cost of average. For more comprehensive design packages including e-commerce, the price rises to about triple the entry-level package, however this is still a bargain compared to prices in the U.S. 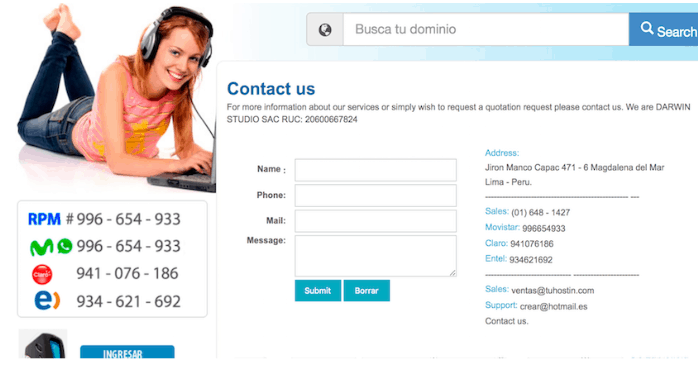 Customer support for Tu Hostin is available via telephone, email, and live chat. Support is listed as being available 24 hours a day, however I sent an email query to support but did not hear back from them. Peruvian web hosting provider, Tu Hostin offers basic shared Linux hosting with different levels of data. The entry-level package is average-priced for Peru but considered very affordable compared with North American providers. It also has full web design services that include e-commerce. Wondering how TU HOSTIN stacks up against other Web Hosting companies? Enter any other Web Hosting company and we will give you a side-by-side comparison.